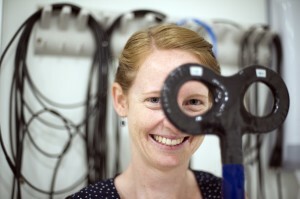 Siobhan Fitzpatrick’s PhD work aims to give back movement. Conditions that decrease a person’s ability to control their muscles, such as spinal cord injury and stroke, have devastating and debilitating consequences for individuals and their loved ones. Imagine not being able to pick up your mug of coffee, or do up the button on your coat. Small daily tasks, that many take for granted, can prove impossible for those with damage to the neural pathways responsible for muscle control. My PhD, being conducted within the Taylor Group here at NeuRA, is focused on the use of a variety of brain, spinal cord and nerve stimulation techniques to induce changes (plasticity) at the connections (synapses) between nerve cells in the spinal cord, with the ultimate goal of enhancing the control of muscles. Two techniques our group uses are known as transcranial magnetic stimulation (TMS), and electrical peripheral nerve stimulation (PNS); both are non-invasive methods that can be used to stimulate parts of the nervous system. We can use TMS to stimulate parts of the brain that control specific muscles of the arm, and PNS to excite peripheral nerves that supply the arm. Repetitive pairing of these two stimuli at specific timing intervals can induce synaptic plasticity in the spinal cord in pathways that control voluntary muscle activity. This technique can enhance muscle activity of the biceps in able-bodied participants and can improve manual dexterity of the hand in participants with incomplete spinal cord injury. The technique has the potential for enhancing activity at any remaining synapses in the spinal cord that can transmit commands from the brain to the muscles; therefore this protocol would be more relevant for those with incomplete spinal cord injuries, when some spinal nerve fibers are preserved. However, even with clinically diagnosed complete injuries where there is an absence of all sensory and muscle activity below the site of injury, there could be some nerve cells within the spinal cord that have the potential to respond to the technique. Although there are a large number of studies that investigate plasticity in the brain, there is limited knowledge of the effects of magnetic and electrical stimulation on plasticity of spinal cord pathways. I am interested in optimising the methods we use. For example, I am asking, is more necessarily better? Indeed, in the most recent study for my PhD, we found that by doubling the number of stimulus pairs we could induce more reliable, longer lasting spinal cord plasticity. What could this mean in the future? What we are aiming for with these methods is small, but functionally relevant improvements in muscle control which, as an example, could be the difference between being able to pick up a cup or not. Work in this area is still in its early days; however my vision for the future is that an optimised technique could be used clinically in conjunction with other forms of rehabilitation, such as physiotherapy, to improve motor control in those with conditions such as incomplete spinal cord injury and stroke.